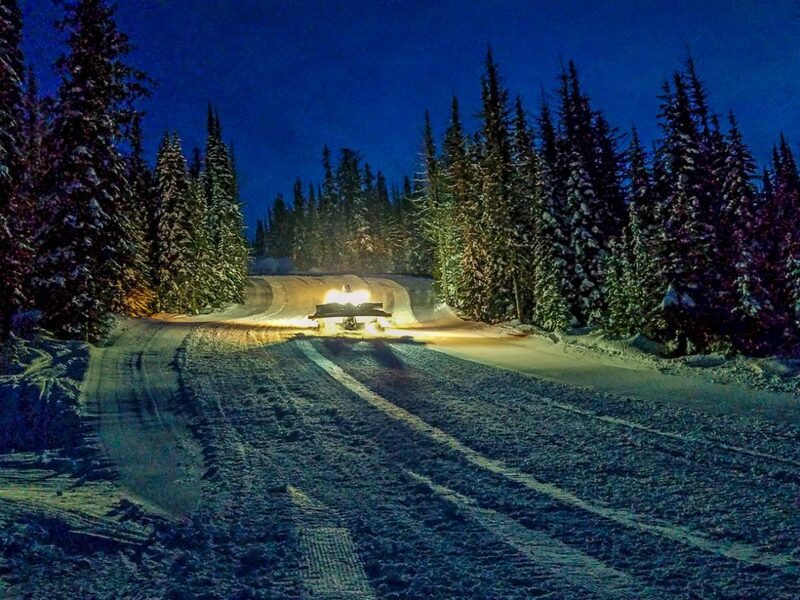 What’s It Like To Groom Trails At Night? Snow cat groomer making the ski run smooth for skiers the next day. Sun Peaks Resort, BC. They come out at night and do their job. You can see their lights progressing across the ski slope and occasionally hear their roar. And the next morning, they’ve left this delicious set of corduroy tracks across the ski hill. I’d always wanted to go on-slope with a snowcat groomer. And so, at Sun Peaks Resort in British Columbia, Canada, I did. And it’s a tour anyone can sign up for. 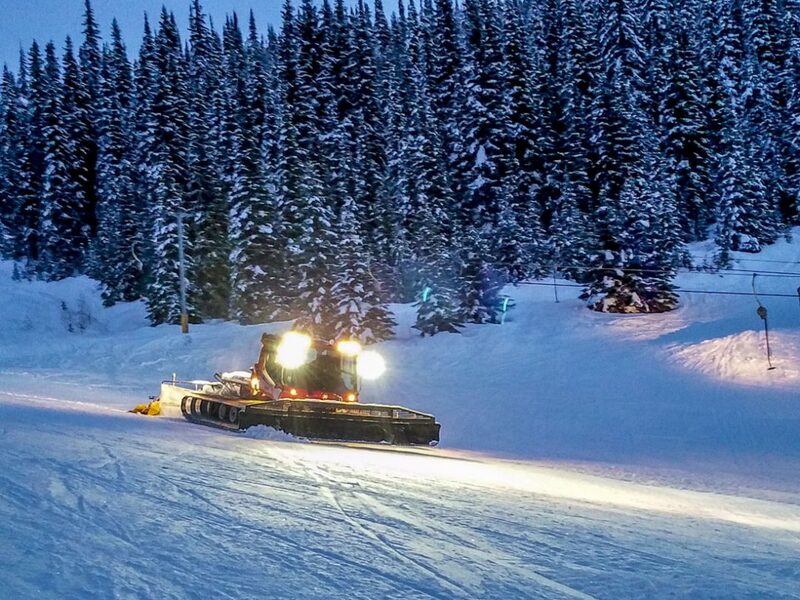 Snow cat groomer makes its way down a ski slope at Sun Peaks Resort, BC. It’s astonishing how much damage skiers can do to a run in a single day. If the snow is soft, bumps form, and the middle gets dug out because that’s where folks prefer to ski. Enter the snowcat groomers. These are powerful cabs—Piston Bully 400s with 320 hp diesel engines— atop tank treads with a blade on front and a tiller on the back. 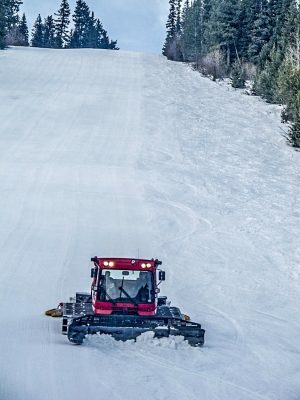 The blade knocks down bumps and that nasty looking tiller, which rotates at over 1,000 rpm, can turn even ice into something resembling powder, which is then smoothed flat into that hero corduroy. Of Sun Peaks’ 24 operators, two are women. “Honestly, the women do a better job. They are more detail oriented,” admitted my guide for the night, Leo. It takes three years for a groomer to really learn how to do this well, he added. It was one of the women running the winch cat that night. Picture eight tons of growling machine attached by a line to a tree to keep from sliding downslope uncontrollably. This is how the really steep runs get groomed. Back in the day, these runs got so bumped and carved out, they were barely skiable. It takes three years to become an expert groomer. Sun Peaks, BC. Rob Gayman, grooming manager at Mt. Hood Meadows resort in Oregon, once described operating a winch cat this way: “It’s somewhat like dropping off a cliff. At the top break-over as the machine teeters above the brink, your heart starts to palpitate, and your natural survival instinct pushes you back into your seat. For me, as dusk fell, the whole scene took on a surreal feel. Our headlights shining on the ridges of snow, leaving them glowing with weird shadows, along with the blinding headlights of an oncoming behemoth. 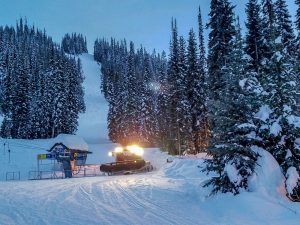 On an average night, more than a third of Sun Peaks Resort’s ski runs will be groomed. But among those, will be every green (beginner) trail. And if you are lucky, your favorite black run will have been groomed early, then covered with ankle deep powder overnight, making for a run that feels, well, like skiing a glacier. There are two women groomers at Sun Peak, BC, said to be more detail-oriented than the men. Thanks for the story Yvette. 40 years ago I rode at night with a groomer at Sunday River. You story vividly brought back the experience. Loved your story! I have always wanted to drive a snow cat. Can’t do that, but a ride in one would be an experience of a lifetime. I am jealous!